Try to watch it from outside and probably you will not see anything but chaos, an indistinct confusion. Come closer, come a little bit closer and, maybe, that sense of confusion will not abandon you. Here, this is the confusion of the Beauty, since in “Cosmos” Harmony lives, in “Chaos” Beauty. 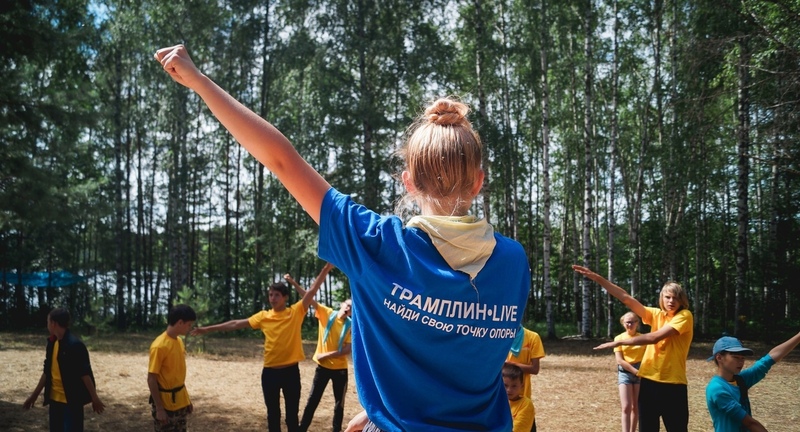 And this is Tramplin’s Chaos.Teenagers from different social situations were given the opportunity to spend about a week together, on Okunyovo Lake, in Yurkino Raion. I believe this is the double gateway to Tramplin, that this year took place on July 18th-27th: a human mixture of backgrounds and languages, that stop having the importance they would have outside; and the possibility to meet new people and to get new knowledge. But even the possibility to reconsider own relationship with nature and technology, finding themselves almost cut off from the world, with no internet and with a heavily limited chances to use phone. Beyond the fact to sleep, for over one week, in a camp tent. Sure, not a easy experience, but one that you easily learn to appreciate, until being nostalgic, after. 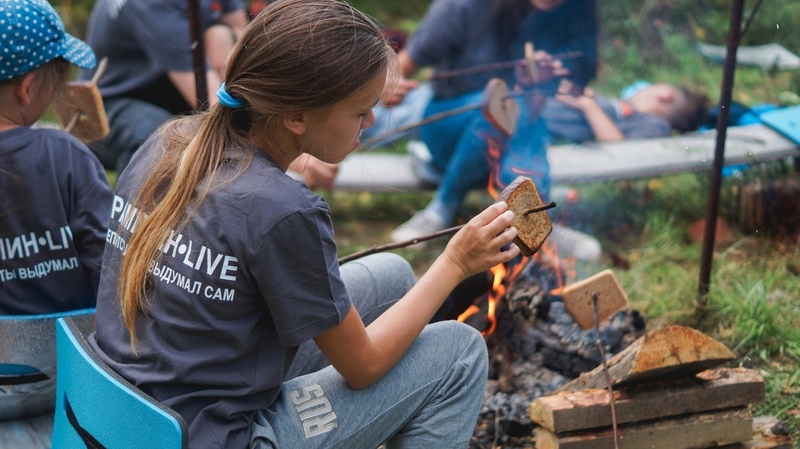 This year the camp focused on survival in nature. 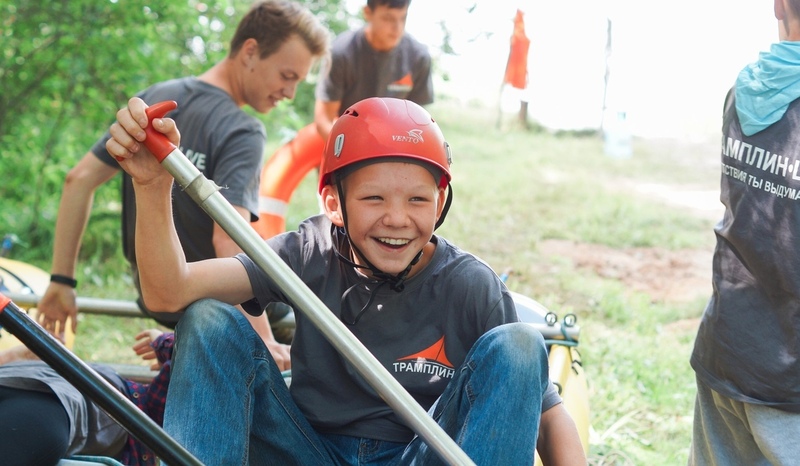 The youngsters of the camp had to possibility to learn to use a walky-talky, to comprehend maritime signals, cardinal directions, first-aid techniques, and practiced free rope and – right this, with no doubts, got them more hooked – learned how to sail a catamaran. The activities were organized by Opora and its partners: MČS, VSKS, Ministry of Natural Resources, Ecology and Environmental protection of the Republic of Mari El, Ministry of Education and Science of the Republic of Mari El and Federal Agency for Youth Affairs. All teachings that they showed to have widely acquired when, the last day of the camp, the 4 teams, in which the about 65 participants were divided, were proved in a quest through the forest and the lake, with the aim to rescue 4 people “lost” in forest, using the techniques and the knowledge acquired. A task took up fast and with success by all the teams. Another innovation of this year has been “Passport of Tramplin’s Republic”, that participants got at the end of a game in which were called to complete all the steps necessary to get the document. A special passport, in which they could attach stickers for the activities and for special merits, but with a lot of pages to write down their own thoughts and to preserve memories from their mates. “I really liked everything. It was very interesting and there were a lot of interesting events. Nice and friendly company and amazing camp leaders (especially Liza – Evs volunteer from Estonia, Ed.). What I enjoyed mostly has been catamaran and free rope. It was very funny and I hope to do it another time”. “I was in this camp four times. As every year, I really enjoyed it. There was a funny and entertaining program. Mostly I liked disco and floating on catamaran. It’s a pity that we were not allowed to fire candles, it isn’t really enough in the tent camp. We had a cool administration, in particular press center”, two young participants declare. Workshops were supported by team-building activities and by the events organized by art-group, the International team inside the administration, whose aim was to foster the creation of the group and to give participants the possibility to express themselves beyond classes. This year art-group decided to give birth to 4 super heroes, with strong national connotations, engaged in the difficult mission to transmit their values to the youngsters of the camp. 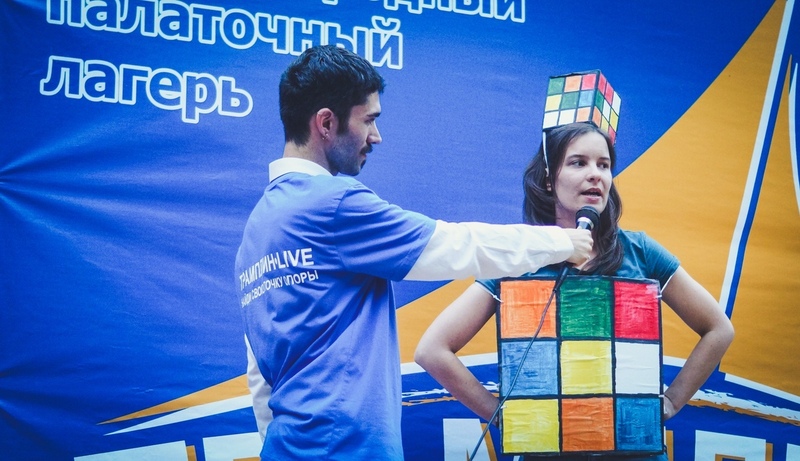 Art-group dealt with the management of games and evening events, among whom “Tramplin’s Got Talent”, “Intellectual Games” and “Mr. & Ms. Tramplin”, beyond disco. As an International group, members had also the possibility to teach something about their own Countries (Estonia, France, Hungary and Italy) to participants. “This has been my third Tramplin, and this time proved itself to be quite challenging, for I was in charge of the art group and for there were fewer volunteers than before. Nonetheless – declares the French Arthur, one of the international volunteers involved in the camp – we managed to create a nice atmosphere and to fulfill our missions with dedication and fun! I gained more confidence in myself and my management skills; I also learned to be more flexible and spontaneous. Tramplin brought me one more time up over myself!”. Tramplin saw also the presence of 3 Evs volunteers, who were an active part inside the administration and who had the possibility to spend some of their time in Russia, facing a new, amazing challenge. “Camping in a tent in the forest, far from civilization with all theirs challenges was not a new thing for me, because as a scout, I do it every summer in my small country. That’s why I was expecting this camp so much. The difference is – not with my usual small group, but with the staff and volunteers of Opora, and with Russian children, which meant excitement, new recognitions, activities and game ideas. I was glad that I not only learned new things, but I could represent my country in form of different interactive games. Working together in the art-group, the neatness, creativity and rapid decision-making of the Opora volunteers were all exemplary to me. I tried to get my share of the joint work and find the activities where I can contribute to the camp’s realization. It was a great experience!” declares Sara, Evs volunteer from Hungary. So, as its name alludes to, “Tramplin” demonstrated to be a trampoline for everybody, maybe a leap in the dark for someone, at the beginning, but for sure a way to test own limits and potentialities.